Reporting tools are useful to analyze the data as per the Business requirements. While analyzing, some companies might interested in Table, or Matrix reports but most companies use Charts (Graphical Representation of data) to see the Trends, Sales Comparisons etc. Like most of the reporting tools, SQL Reporting Services also provides various built-in charts to visualize the data. And, in this article, we will show the list of available charts in SSRS. 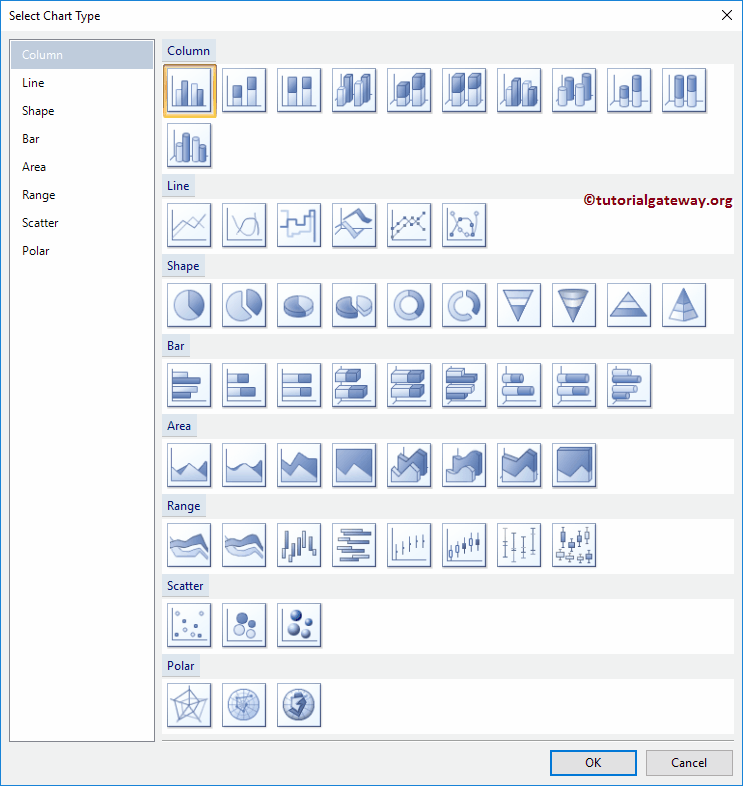 Below screenshot will show you the available list of charts in SSRS or SQL Reporting Services. And the detailed list of SSRS Charts is shown below. All the below-specified heading are Hyperlinks so click on them will show you the respective example. Column Chart: This chart is good for comparisons. You can use to compare Sales By Month, or Sales this year vs previous years etc. Remember, we also explained the Column Chart formatting options at Formatting Column Chart so refer the same. Line Chart: You can use this SSRS chart to display the Trend. For example, Sales Trend, a temperature at continuous time period etc. Pie Chart: It is very useful to display the High-level data. Remember, we also explained the Pie Chart formatting technique at Formatting Pie Chart so refer the same. Funnel Chart: This SSRS chart is useful to visualize the Data in stage wise. Pyramid Chart: Similar to Funnel Chart, It is helpful to view the Data in stages. Area Chart: This is used to graphically represent the quantitative data. Range Chart: You can use this chart to visualize the data between the minimum and Maximum value. Radar Chart: is very useful to visualize the numeric data in 360 Degrees. SSRS also provides the Data Bars, Gauges, Spark Lines, and Indicators. You can these SSRS charts inside the Table, or Matrix reports.